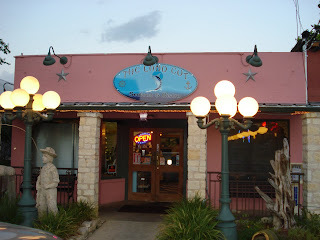 The most recent entry into the restaurant world in nearby Blanco, Texas identifies itself as The Land Cut Seafood and Bistro, located at 306 Pecan Street (in a location that formerly housed the Mexican Restaurant Oso)...conveniently located next to the police station, for, if ever a food crime was committed, it was committed last evening on my party of four. I simply can not digress here. I’ve got to get right to it and maybe, just maybe, save others from what we endured. The first indication that things were headed south occurred as we approached the front door to enter. We were met by the cook headed out carrying a trash can. I guess they don’t have a back door, possibly to prevent customers from running out the back without paying. We continued on. Nothing’s changed...still the same old display cases as when it was Oso. I would imagine still the same old cookies being sold by the register. We were ushered into the patio room in the back and told it was much cooler out there. It was comfortable and the furnishings appeared to be new. A cheerful young thing suggested we order margaritas...we did. It seems our cheerful young thing was so young she had to get someone else to serve them; she won’t be eighteen for three more months. No problem. We were given computer printed paper menus...mine was extremely food stained. The selections looked enticing. Friend and his Significant Other opted out on the appetizers (what did they know we didn’t?). The Child Bride has always liked raw oysters on the half shell and I have usually been able to get down one or two just to keep things interesting so we went for a half dozen. Now, bear in mind, the menu said oysters on the half shell and that’s exactly what we were served...six oysters from a container that were placed atop the cleanest and most pristine oyster shells which had obviously been through the dishwasher more times than a John Cameron Swayze Timex. There was no brine...no bits of grit...you know, all of the things that make oysters on the half shell so good. In addition, they were not even cold and just barely cool. We had to ask for red sauce and crackers. I ate one and the Child Bride of more than four decades could only choke down two. So much for any late night friskiness. On to the entrées... The choices were quite varied and all sounded good. 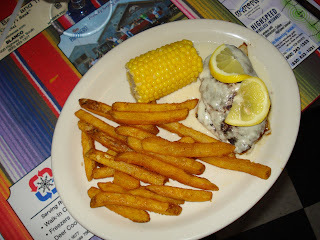 I settled for the Lafayette, a herb-encrusted snapper filet topped with a grilled crab cake ($15.95). The Child Bride could not narrow down her choices so she went for the Seafood Platter ($19.95) -- Flounder, Scallops, Shrimp, Oysters and Crab Cake...all fried. Friend said his favorite fish was Sword and there it was, right on the menu ($15.95). His comment after ordering it was, “Most places just don’t get it right. It’s usually dry and overcooked.” His words would come back to haunt him. His Significant Other is a fried shrimp (small order $11.95) fan and even said she actually liked the frozen version you buy at the market...the only one among us not to be overwhelmingly disappointed with the meal. Let me take them in the order listed above. The herb crust on my snapper consisted of some dark green bits of plant life I could not discern...nothing crusty about it at all. The crab cake that topped it reminded me more of what we were served every Friday at Carl Schurz Elementary in New Braunfels. It had been flattened, charred and was red in color...more of a disgusting salmon croquette. The snapper filet itself could not be cut with just a fork. I had to use my knife to hack through the overdone, obviously previously frozen slab of something they were trying to pass off as fish...I thought it might take dynamite to achieve that kind of texture...but enough about me. The Child Bride started piling her fried fish on my plate hoping I would help her eat what she absolutely had no idea of. I took one bite of what was supposed to be fried flounder and bit down into a large mouthful of crisp batter. No, thank you. 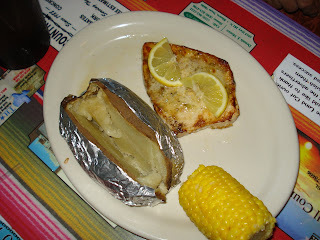 Friend’s words proved prophetic and he managed to down about four bites of the swordfish before pushing his plate to the side. As I mentioned, his Significant Other actually tolerated the fried shrimp. The wine list consisted of four wines, one of which I have no memory. The three that frighteningly come to mind were a Merlot from some non-descript vineyard, a White Zinfandel and your typical California Chardonnay. We opted for beer. The front of the menu boldly proclaims the fish to be fresh. If this is the case, the owners of The Land Cut need to march right next door and file charges against their purveyors for deceptive trade practices. Dessert was simply out of the question. We paid way too much and left a respectable tip for the cheerful young thing and miserably made our way to the front door. I am truly amazed at how a restaurant can buy from the same suppliers all of the other restaurants deal with, there aren’t that many of them, and yet serve food so disastrously worse than the others. Wait...I’ve got it. The cook wasn’t taking out the garbage...he was bringing it in. Your comments regarding dinner at The Land Cut Seafood and Bistro in Blanco brings to mind the opening line found in a John Keats soliloquy, "What is more gentle than a wind in summer?" Certainly your review qualifies. You have exhibited more restraint than a plethora of Bettie Page one-reelers. We at Needtovent are impressed, but being the fellow who was served a hockey puck that posed as a swordfish filet, I, personally, feel you could have been far more negative. To our readers: This was my worst dining experience since I once ordered the chicken kiev entree on an Eastern Airlines Convair 440. I am sorry that your dinner experience was so bad. I have only eaten lunch at the Land Cut and found the food to be o.k. The sevice was good. I hope you will come back and try the steak place next door. Or the BBQ next to it. I think you will find the food much better. I really like them both.